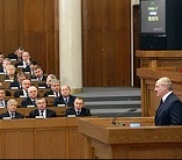 No economic reforms will be carried out in Belarus, Alexander Lukashenka announced in his 26 January address to the government. This was the fourth time since the October 2015 presidential election that the President confirm his desire to keep the existing state-dominated economic system. Lukashenka's statements suggest an ongoing struggle within the political elite over the country's economic future. The anti-reform coalition includes heads of state-owned enterprises, officials who work in the ministries and concerns tasked with coordinating the state sector, and supervisory agencies that benefit from arcane rules and regulations. So far, the President has sided with the old guard on the desirability of economic reforms. Economic reforms such as reducing subsides to state enterprises and allowing private business more freedom have been on the government's agenda for a long time. Lukashenka frequently references to the reforms them when accusing his government of seeking to "inhibit the development of Belarus's political system." According to Lukashenka’s economic adviser Kiryl Rudy, "since 2013 all leaders of the Government and the National Bank … have generated structural reform programmes." And these programmes are becoming more comprehensive because of the government's growing awareness about the need for reforms. The advocates of reforms include First Deputy Prime Minister Vasil Maciusheuski, Deputy Head of the Presidential Administration Mikalai Snapkou, Lukashenka’s economic adviser Kiryl Rudy, Chairman of the National Bank Pavel Kalavur and others. All of them attended the meeting on on economic development held on 26 January and headed Lukashenka's announcement. On average, members of the pro-reform coalition hold higher positions in the government than its opponents do. They have built ties with independent economists and international organisations. They are not only more pro-Western, but also more knowledgeable about the economy than an average Belarusian bureaucrat. These people support the reforms because they see no other option for generating economic growth. And yet the pro-reform group is currently losing ground to the opponents of economic changes. In December 2015, daily “Belarus Segodnya” (Belarus Today) published two lengthy articles by Siarhei Tkachou, Lukashenka's former economic adviser. In the articles, Tkachou criticises free market principles, praises Belarus's current economic model, and warns about the dangers of embarking on "radical reforms." Tkachou's uncompromising position suggests that he may stand at the forefront of the old guard that opposes the economic reforms. The fact that his ideas were printed in the largest and most read Belarusian newspaper suggests that they reflect an influential strand of thinking among the country's political and economic elite. Trakchou's views are certainly shared by heads of state-owned enterprises who view the reforms as a danger to their comfortable existence. According to Belstat, the national statistics office of Belarus, every fifth state-owned company remains unprofitable. Without government subsidies and protectionist policies, most of these entities will go out of business. Their directors will lose jobs. The officials who work in the ministries and concerns tasked with coordinating the state sector will also suffer from economic restructuring. Many of these entities, such as the Ministry of Industry or the State Concern for the Production and Sale of Light Industrial Products, continue to advocate increasing governmental subsidies. The third group of potential "losers" comprises various supervisory and law-enforcement agencies. In 2014, the Ministry of Taxes and Fees uncovered violations in the documentation of 99% of private entrepreneurs it inspected. In 2015, 99 out of 100 customs inspections revealed violations according to the representatives of the State Customs Committee. Such high rates of violations might be due to arcane rules and regulations, on the one hand, and to corruption within the law enforcement and supervisory agencies, on the other hand. Many state agencies do not play a productive economic role. Instead, they serve primarily the material interests of their employees. Simplifying Belarus's economic legislation and limiting powers of supervisory agencies will deprive their personnel of abundant opportunities for rent-seeking. The economic reforms will also deprive the soil under the feet of many advocates of the previous economic policy which lead to the current sorry state of the Belarusian economy. Consciously or not, these people misstate the facts to avoid reforms. For example, Leader of the National Academy of Sciences of Belarus Uladzimir Husakau recently said that the growth of the Belarusian economy in 2016 could reach 8-8.5% of GDP. This is a striking and unrealistic prognosis at the time when everyone in the government, international organisations and independent think tanks expects further recession. The anti-reform camp lacks clear leaders, but is held together by the broad consensus among the middle and low-level Belarusian officials. These people believe that the current economic crisis will hardly destroy Belarus's political system, while system reforms might. Many key figures in Belarusian politics, including the President’s son Viktar Lukashenka and Belarusian Foreign Minister Uladzimir Makei, have remained silent on the subject of economic reforms. It is these people who will determine which side the president chooses in the reform debate. The Belarusian leader may prefer the ideas of the lower levels of the bureaucracy for two reasons. First, Lukashenka and the anti-reform coalition share the fear that the reforms will take away their privileges and their ability to control the economy. They also worry that political liberalisation will follow economic changes in Belarus. Second, Lukashenka does not see the benefits of structural reforms. According to him, there is no reason to "break something in vain while overly straining the people." By “the people” the President means not only the ordinary citizens, but also the entire ruling class. Yet this does not mean that the President is firmly wedding to the anti-reform coalition. After all, it was Lukashenka who appointed some of the prominent advocates of reforms to senior positions in the Government, the Presidential Administration, and the National Bank. It is notable that Lukashenka allows both sides to conduct a fairly sharp – by Belarusian standards – debate about the costs and benefits of economic changes. After that, he will make up his mind. In December and January the Ostrogorski Centre analysts are busy analysing Minsk’s complicated games in foreign policy and security affairs, finalising the most recent issue of the Journal of Belarusian Studies and organising a conference on Belarusian studies. It appears that Belarus continues to cooperate with Ukraine on the issues where Belarus can gain financially and technologically, while keeping its distance from aggressive Russian foreign policy. Minsk has also managed to win the standoff over a Russian air base in Belarus. Siarhei Bohdan argues that Minsk consistently avoids supporting Moscow in Ukraine and Syria. Belarus is continuing its active collaboration with Kyiv, aimed not only at business deals but also at acquiring the military technology which Russia has failed to provide it with. At the same time, Minsk seems to be winning the ongoing game over a Russian air base. A base will, it seems, not appear in Belarus in the near future, and on top of that Belarus will soon have Russian warplanes at its disposal. Igar Gubarevich in his foreign policy overview shows that despite his renewed right to travel to Europe, Lukashenka’s “social circle” has so far remained limited to authoritarian countries. 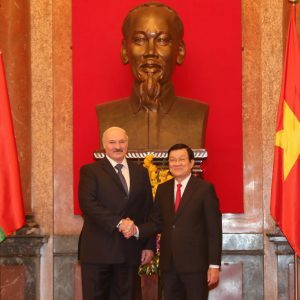 While visiting and hosting Asian and African colleagues, the Belarusian leader had to postpone his most important foreign trip to Moscow because of disagreements over relations with Turkey and the Russian air base in Belarus. Ryhor Astapenia analyses the performance of Belarusian industry in 2015. While many enterprises, such as Kamvol, are poised on the verge of bankruptcy, others like potash exporter Belaruskali have saved the Belarusian economy, allowing inefficient industries to be subsidised. Siarhei Bohdan in an interview with the Belarusian service of Radio Liberty comments on the normalisation of Belarus-EU relations and their future in 2016. According to Bohdan, Belarus is trying to pursue a neutrality policy in a quiet manner and is seeking to boost trade cooperation with the EU. However, warming of relations will not change domestic politics significantly, as it will be dominated by Russian and Ukrainian factors. Aljazeera quoted director of the Ostrogorski Centre ​Yarik Kryvoi, who analysed the reasons why the Belarusian authorities refrain from large-scale privatisation and its associated social costs. The Aljazeera piece also cited Ostrogorski Centre associate analyst Alieś Aliachnovič’s article on BelarusDigest dedicated to the role of Russia’s subsidies in the Belarusian economy. Ryhor Astapenia together with several well-known experts summed up the year 2015 on Radio France Internationale. Among the most important events of the year Ryhor mentioned was Svetlana Alexievich’s Nobel Prize, which put Belarus in the focus of world media, and the October presidential election, which demonstrated people’s disappointment with politics and the economic crisis in the first years of Lukashenka’s new term in power. Siarhei Bohdan discussed with the Belarusian Programme of Polish Radio current trends in the development of the Belarusian Armed Forces. Despite the declared military union with Russia, the Belarusian army is seeking more autonomy and hampering major bilateral military projects. Yarik Kryvoi and the Ostrogorski Centre’s senior analyst Siarhei Bohdan commented on the role of sanctions in Belarus’ relations with the west for WorldECR, the Journal of Export Controls and Sanctions. According to the experts, the European Union should increase its presence in Belarus to be able to influence the situation from the inside. Patient critical engagement and economic modernisation can ultimately strengthen Belarusian statehood and improve the human rights and democracy situation. Vadzim Smok took part in a discussion titled In What Ways Can We Talk about the Nation and Nationalism Today?, organised in Minsk as a part of the Debates on Europe programme and supported by the German Federal Foreign Office. The experts exchanged ideas on various models of nation-building in today’s Belarus and the role of nationalism in this process. Siarhei Bohdan discussed with Radio Racyja the problem of the shadow economy in Belarus. The Belarusian government allows the existence of a sizeable shadow economy because its main revenue comes from outside the country, mainly from Russian hydrocarbons. Many businesses operate via illegal schemes, and the authorities turn a blind eye to them in exchange for political loyalty. The Ostrogorski Centre and the UCL’s School of Slavonic and East European Studies (SSEES) invite proposals from established academics and doctoral researchers for individual papers and panels to discuss various aspects of contemporary Belarusian studies. The conference will take place on 23-24 March 2016 at the SSEES in London. The Annual Lecture on Belarusian Studies will follow the main conference panels. The conference will serve as a multidisciplinary forum of Belarusian studies in the West and offer a rare networking opportunity for researchers of Belarus. The conference call for papers is available here and the deadline is 15 February 2016. The Ostrogorski Centre presents the 2015 issue of the Journal of Belarusian Studies. The new issue of the journal focuses on the Belarusian-Polish-Lithuanian borderland and the period stretching from the uprising of 1863 to the inter-war period of the 20th century when the territory of today’s Belarus was split between the Soviet Union and Poland. 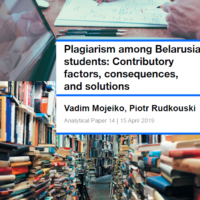 Two longer articles are followed by several essays which resulted from a conference held by the Anglo-Belarusian Society and other London-based organisations at University College London in March 2014. This issue also includes the transcript of the first Annual London Lecture on Belarusian Studies, and two book reviews – one by Stephen Hall examining the meaning of Europe for the Belarusian and Ukrainian authorities, and the other by Siarhej Bohdan looking at relations between various ethnic groups in Eastern Poland in the inter-war period, which is now Western Belarus. The issue features authors from Estonia, Lithuania, United Kingdom, Belarus and Sweden. The BelarusProfile.com database now includes the following personalities: Aliena Arciomienka, Andrej Parotnikaŭ, Uladzimir Kaltovič, Dzmitryj Markušeŭski, Juryj Caryk, Kiryl Koktyš, Aliaksandr Aŭtuška-Sikorski, Andrej Rusakovič, Siarhej Vazniak, Uladzimir Kavalkin. We have also updated the profiles of Stanislaŭ Kniazieŭ, Anton Kudasaŭ, Valiery Kulakoŭski, Aliaksandr Lahviniec, Dzmitry Lazoŭski, Žana Litvina, Anatoĺ Lis, Ihar Laciankoŭ, Alieh Latyšonak, Paviel Latuška, Viktar Lukašenka, Anatoĺ Liabiedźka, Anatoĺ Marazievič, Viktar Marcinovič, Siarhiej Maskievič, Andrej Šorac, Andrej Hajeŭ, Uladzimir Amaryn, Maksim Jermalovič, Dzmitry Charytončyk. Ina Ramašeŭskaja, Natallia Rabava. What motivates public servants in Belarus: money not important. BIPART, 2015. Uladzimir Kavalkin. Public procurement: increasing transparency and accountability. BIPART, 2014. Ina Ramašeŭskaja, Tacciana Čulickaja. Do government agencies operate effectively? Modern challenges and responses. BIPART, 2014. Kaciaryna Korzun. Public-private partnership in Belarus: what is after the law? BIPART, 2014. Dzmitry Markušeŭski. On the way to e-government in Belarus. BIPART, 2013. Anastasija Luzhina. Pension benefits as a component of the social security system. BEROC, 2015. Katsiaryna Barnukova. Support of maternity in Belarus. BEROC, 2015. Katsiaryna Barnukova, Anastasiya Luzhina, Katsiaryna Lisiankova . Pension system of belarus: current state and necessity for reforms. BEROC, 2015. Alieh Mazol. Local government in the Republic of Belarus. BEROC, 2015. Dzmitry Kruk, Katsiaryna Barnukova. Decomposition of economic growth in Belarus. BEROC, 2014.